Ronan Hale had to pull out so they got permission from Ipswich to travel over. Drinan has signed on loan with Waterford. As well as the increased coverage of the SSE Airtricity League, eir sport will also broadcast all five of the U21 Republic of Ireland team home fixtures in the UEFA U21 2021 European Championships qualifying campaign. Kicking off against Luxembourg on March 24, Ireland will also host Armenia on September 10, Italy on October 10, Sweden on November 19 and Iceland on March 26 2020, with all five games live on eir sport. 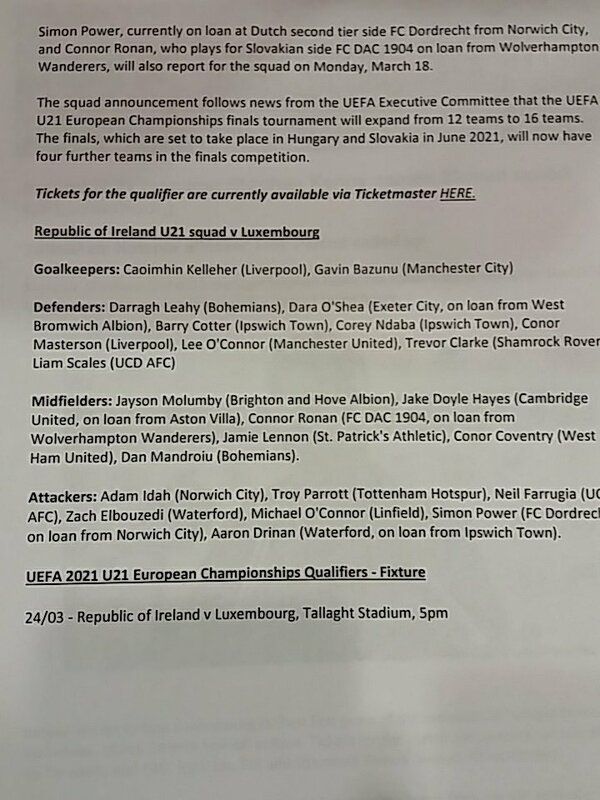 Republic of Ireland Under-21 manager Stephen Kenny has announced his squad for the UEFA U21 European Championships qualifier against Luxembourg. Ireland are set to face Luxembourg in their first game of the campaign at Tallaght Stadium on Sunday, March 24 with kick-off at 5pm. Tickets for the match are currently on sale at just €5 for adults and FREE for U18s, FAI Season Ticket Holders and Shamrock Rovers Season Ticket Holders. Kenny has named a 22-man squad which includes seven players from the SSE Airtricity League. Darragh Leahy and Dan Mandroiu of Bohemians, Liam Scales and Neil Farrugia of UCD AFC, Waterford's Zach Elbouzedi, Shamrock Rovers' Trevor Clarke and St. Patrick's Athletic midfielder Jamie Lennon have all been named. Liverpool duo Caoimhin Kelleher and Conor Masterson, Manchester United's Lee O'Connor, Manchester City's Gavin Bazunu and Tottenham Hotspur's Troy Parrott have also received call-ups to the U-21 squad. Simon Power, currently on loan at Dutch second tier side FC Dordrecht from Norwich City, and Connor Ronan, who plays for Slovakian side FC DAC 1904 on loan from Wolverhampton Wanderers, will also report for the squad on Monday, March 18. The squad announcement follows the news from the UEFA Executive Committee that the UEFA U21 European Championships finals tournament will expend from 12 teams to 16 teams. The finals, which are set to take place in Hungary and Slovakia in June 2021, will now have four further teams in the finals competition. With Idah and Parrott in the squad, does that mean Cassidy will be in the U19s? Parrott is injured at the moment, but has posted on instagram that he's back in training. Last edited by tetsujin1979; 13/03/2019 at 1:33 PM. Town striker Aaron Drinan, who is loan at Waterford until the end of June, has also been selected for the final Ireland squad. A bit soon to hand him his under 21 debut against the country of his birth? He on the standby list, according to Raf Diallo (Newstalk). A few notable omissions and disappointing Nolan wasn't picked again. But, overall, there's a blend of great younger players, home-based players, lads playing under 23 and senior football. He's gutted the U19s Elite Stage Squad for a game at home to Luxembourg. Lee O'Connor, Adam Idah, Conor Coventry will all be sorely missed. Qualifying is a huge boost for everyone involved in our youth setup, both in terms of seeding going forward and in terms of keeping good dual eligible players interested (Reason we lost Marcus McGuane). The U17s performance last summer did both the players and set up a world of good. We need to win a group consisting of Russia, Romania and Azerbaijan, played in Russia. Not easily but doable. If we fail to qualify, the FAI should take a serious look at the decisions that were made. You could easily have lined up with Nolan and Masterson in at centre-half and kept Lee O'Connor down. As for attackers, between Ronan Hale, Farrugia Drinan, Michael O'Connor and Drinan, surely there's enough firepower there to beat Luxembourg. Any reason given for omission of Nolan? Very disappointing if just a plain overlook. Is Luca Connell not a big ommission or would he be more likely to be in u19s?